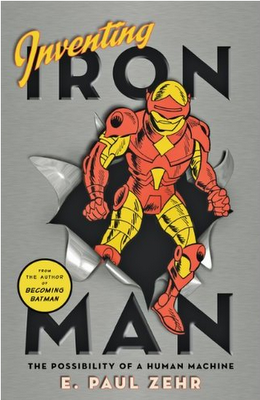 Physics Buzz: Comic-Con: Building a real Iron Man suit? E. Paul Zehr, a professor of kinesiology and neuroscience at the University of Victoria, spoke at the 2011 Comic-Con comic book convention in San Diego on Thursday afternoon. The author of Becoming Batman: The Possibility of a Superhero talked about his new book, due out next month, called Inventing Iron Man: The Possibility of a Human Machine. Yves Rossy, the Swiss jet man, flies with a small set of wings and a jet pack attached to his back. With the exception of the wings, he resembles the Iron Man in comic form, arms stuck back against the body and head flying first. The only problem with Rossy's flying is he can't carry enough fuel to get himself off the ground; he'd be too heavy to fly. Instead, he skydives out of a small plane and rockets away. Zehr said the Iron Man suit cannot be merely a set of clothes worn over the body: Clothes are too slow to respond to movement. To be a functional suit, the Iron Man costume must be integrated with the body, controlled by the mind and worn like skin. Modern-day prosthetics are close, but there are limitations. It takes time for the brain to transfer a signal to an artificial limb, and though the lag time between signal and limb movement, is small - on the order of milliseconds - it's still too slow. We need to find a way to make the signal transfer instantaneous, Zehr said. Though there are mind-suit interaction limitations, the physical manifestation of a suit that can move like a human is already in use helping accident victims in rehabilitation. One machine can move a person's legs as though he or she was walking without any input from the human. In the last 40 years, technology has advanced to the point where we can just about build the first suit seen in the first Iron Man movie with Robert Downey, Jr. The only problem: It would take a battery the size of a room to power it, Zehr said. In the same way we've managed to squeeze the power of an Apollo-era computer into a small phone over the last 50 years, maybe we can do the same with Iron Man suit technology over the next 50. SUPERB PAGE!!!!!!!!!!!!! I like it a lot.even i wanted to create an iron man suit.